Pete Escobar published an article in the Hong Kong press when Trump took office that is a must read for anyone that wants to understand his administration’s approach to foreign policy, particularly US-Russia relations. Read the article here. Virtually everything Trump has done with regard to foreign policy fits with the paradigm described in this article. The source of the Trump administration’s foreign policy ideas appears to be the Center for Strategic and International Studies. 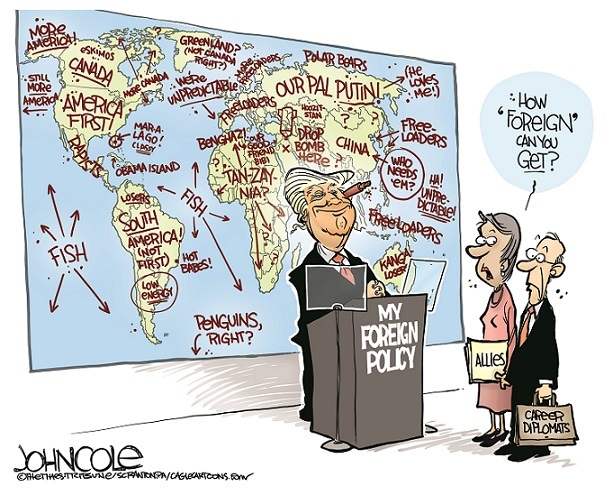 Trump’s foreign policy approach seems to be a move away from the neocon paradigm that has dominated Republican foreign policy approaches since the Reagan period, and a return to the Nixon/Kissinger approach of the Rockefeller Republicans. This is consistent with Trump’s New York background. His administration is moving back toward the Nixon/Kissinger approach and away from the neocon Republican or liberal internationalist (neocon lite) Democratic approaches. He’s been more of a neocon on domestic policy than on international relations, though in a very pragmatic way. Trump’s economics seem to be the standard right-wing Keynesian approach that has dominated the Republicans since the Reagan period, although on trade he has departed from that a bit (although Reagan did so as well on a selective basis). My guess is that a lot of folks among the power elite now regard having let the neocons run foreign policy as a mistake, and as having created too many liabilities and are now pushing them to the side. Notice even the neocon mouthpieces at FOX, who have been reluctant Trumpians, are getting upset about the Putin summit. The only exceptions have been Tucker Carlson, the token paleocon on FOX, and Hannity, who only cares about his ratings, and the fact that most of his fans are diehard Trumpians. Thus far, Trump seems to be pursuing Nixonian detente with Russia for the purpose of reducing the potential for nuclear conflict, expanding the petroleum trade with Russia, containing jihadi terrorism in Central Asia, and wooing Russia away from an alliance with China. It is clear that the Trumpians regard China as “the main enemy,” though primarily in an economic rather than military sense. The Trumpian objective appears to be to contain China through leveling out the trade deficit and reducing dependence on Chinese manufacturing and banks, and countering China’s economic expansion into Latin America, Africa, and Central Asia. When it comes to relations with the Global South, the Trumpians are clearly traditional imperialists. However, the Trump administration has also pushed for a “Nixon goes to China” moment with the DPRK. My guess is that the Trump people regard North Korea as a nuisance they would rather not bother with, and are fine with detente with the DPRK providing it proves to be workable. Trump has also been less hawkish on Syria than either the neocons or liberal internationalists, except for a couple of relapses into “human rights” crocodile tears. Because Syria is a Russian client state which is also a bulwark against jihadi terrorism, it is likely the Trumpians will continue to take a softer line regarding Syria in the future. However, the Trumpians have also taken a much harder line against Iran, and engaged in a parallel expansion of aid and support for Israel and Saudi Arabia. Much of this obviously has to do with the influence of Israel over US foreign policy, and the relationship between Saudi Arabia and US oil companies, and the fact that Iran is the chief rival to both nations in the Middle East. But there also seems to be a wider geopolitical purpose which is to disrupt the alliance between Russia, Iran, and China by pursuing detente and cooperation with Russia, taking a harder stance against Iran, and strengthening relations with Israel and the Gulf states in part for the purpose of curbing Chinese influence in Central Asia and the Middle East. For instance, Trump’s decision to keep the war in Afghanistan going was likely intended for the purpose of keeping the Chinese out of Afghanistan and away from Afghanistan’s mineral resources. The principal source of conflict between the neo-Nixonian perspective of the Trumpians and the neoconservative/liberal internationalist wings of the foreign policy establishment is that the Trumpians regard China as the primary enemy, whereas the latter regard Russia as the primary enemy. The Trumpians view China as a trade and geopolitical rival while the foreign policy establishment views China as a source of cheap manufacturing and debt financing. The Trumpians view Russia as a possible ally against China, while the anti-Trumpians consider Russia to be an obstacle to the expansion of NATO. However, the Trumpians appear to regard NATO as lacking cost effectiveness, and the Europeans as trade rivals and unreliable military allies. This intra-power elite conflict over what the relationship between the US and Russia should be is apparently the basis for the anti-Russian hysteria that is being fueled by the liberal internationalist and neconservative wings of the US media at present.